Four vegetable-based soaps are infused with exfoliating and skin-nourishing tea leaves. A cup of tea warms you inside and melts away the day's tension. Now, your skin gets in on the soothe fest with these unique soaps. Each vegetable-based bar is infused with real tea leaves to exfoliate and all-natural oils to moisturize from head to toe. 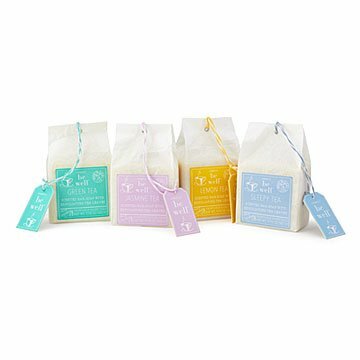 The set of four includes: Green, Jasmine, Lemon, and Sleepy Teas. Heaven-scented and gift-ready, the over-sized bars are beautifully packaged to resemble a paper sachet of tea. Made in San Francisco, California. I just had to try tea bag soap. I bought it as a lark and got wonderful, creamy, chunky bars of soap that clean well without drying my skin and smell great.